In the days of: The birth is precisely related to a then ruling king, Herod. Compare the precision of Luke 3:1, 2. This is an historical event. Prostrate: The Greek is PROS-KYNESAI (bow before + kiss) and means a bowing to the ground and generally kissing the fringe of a garment or feet. Or, KJV: worship; RH: bow down; TCNT: do homage. 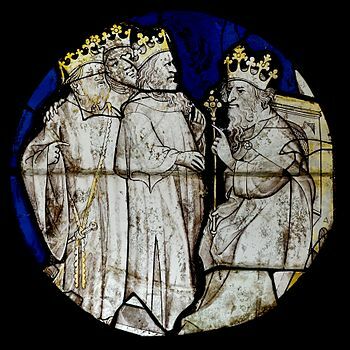 Herod: The idea of another king of the Jews – which was what Herod was – was fraught with suspicion. The Romans would look with great disfavor on such an idea. All of Jerusalem: The news is widespread and there is a general agitation over the idea. Chief priests: The Greek is ARCHIEREIS and likely the source of the English “hierarchy.” This class of Jews is to appear 65 times. Scribes: The Greek is GRAMMATEIS; or, grammarians, writers; those who copied the Holy Scriptures. The group is to occur 54 times. Many later become Christians. Written by the prophet [Micah]: The prophet is Micah (Micah 5:2). Matthew is to use the word most often with Luke second. Governor: Or, BECK: a leader; WEY: prince; MON: ruler. This is understood to be the Messiah, foretold King of the Jews. My: That is, Yahweh. It is clear the future Governor or Ruler is not Yahweh but the Messiah. They are two different persons. Today many celebrate Christmas as a reminder, as C. S. Lewis put it, “that the rightful King has landed and has invited us to take part in his campaign of sabotage against all the powers of the world that seek to lie to us and to destroy all that is good and beautiful in the world.” Though the Christmas celebration have a pagan origin and are months away from the real birthday of Jeshua, the Nazarene Jew who we consider to be the promised Messiah, born 17 October 4 BCE. It was that man, born at the time of Herod the Great and the Big falling Star, born in un-kingly conditions (in full simplicity), who later entered Jerusalem on a donkey (a colt) as a sing of kingship, a few days later to be killed on a wooden stake with the sign on top of him marking him as the”King of the Jews”. Christians should be more aware of the civil historical facts, who was ruling when and which orders were decreed (Like the week of the consensus, the days of the slaughtering of young children, etc.). Herod born around 74 BCE in Idumea, south of Judea, had been apointed governor of Galilee at 25, and his elder brother, Phasael, governor of Jerusalem, by his father Antipater the Idumaean. He had captured Jerusalem and executed Antigonus. 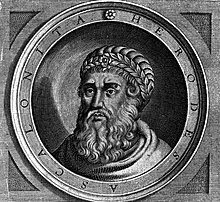 Herod took the role as sole ruler of Judea and the title of basileus (Βασιλεύς, “king”) for himself, ushering in the Herodian Dynasty and ending the Hasmonean Dynasty. He was granted the title of “King of Judea” by the Roman Senate, and took on an authoritarian attitude, having a secret police to keep everything under control. Herod was responsible for the construction of the palace of Masada and the rebuilding of the temple on Temple Mount, a portion of which remains today as the Western Wall and re-established the Sanhedrin. In addition, Herod also built the harbour at Caesarea. In the attempt to destroy the infant Jesus children of Bethlehem “from two years old and under,” were killed by his order. The Innocents have been venerated in the Christian Church as martyrs since ancient times. In the Eastern Church they are known as the Holy Children. The remembrance of this Infanticide in Bethlehem, venerated in the Christian Church as martyrs since ancient times, are known in the Eastern Church as the Holy Children, , in Belgium known as “Onnozele kinderen” (Innocent children) is celebrated on Holy Innocents’ Day, December 28, in England known as Holy Innocents formerly remembered on Childermas, celebrated in Spain and parts of Latin America in a similar way to April Fools’ Day. Herod the Great divided his kingdom among his sons Archelaus, Herod Antipas, and Philip. 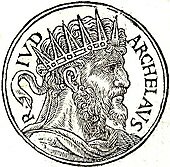 Archelaus (d. after 6 CE) ruled Palestine south of the Vale of Jezreel from 4 BCE to 6 CE; he was removed by Augustus after complaints by the Jews. Herod Antipas (d. after 39 CE), tetrarch of Galilee (4 BCE–39 CE) and Peraea, repudiated his wife, daughter of Aretas, to marry his niece Herodias, wife of his half-brother Herod Philip, whom she divorced to marry Herod Antipas and was the Herod who executed John the Baptist and who was ruling at the time of Jesus’ death. Herod the Great disregarded many of the demands the Pharisees for the construction of the temple, which caught their anger. Simultaneously, the Sadducees, who were known for their priestly responsibilities in the Temple, were opposed to Herod because he replaced the high priests with priests from Babylonia and Alexandria (in an attempt to gain support from Jews in the diaspora). At the end of Herod’s reign, anger and dissatisfaction were common feelings amongst the Jews. Heavy outbreaks of violence (such as riots) followed Herod’s death (4 BCE), in many cities including Jerusalem. All the grievances the Jews had toward Herod’s actions during his reign, such as heavy taxes and violating the rules, built up during the years before he died. Because of the treatment the Jews were receiving, they were ready to break free from Roman Rule. Herod’s leadership sparked such anger, that eventually it became one of the causes driving the Great Revolt of 70 C.E. There’s no pre-birth travel involved for Joseph and Mary, and indeed the elaborate story of Archelaus’ rule over Judaea is later told to explain why the couple went to Nazareth. Joseph heard that Archelaus ethnarch of Samaria, Judea, and Idumea (biblical Edom) from 4 BC to 6 CE, the son of Herod the Great and Malthace the Samaritan, the brother of Herod Antipas, and the half-brother of Herod Philip I had come to power after the death of his father, Herod the Great. Archelaus appeared to be kind to the populace in Jerusalem in order to appease their desires for lower taxes and an end to the (political) imprisonment of Herod’s enemies. Archelaus acted in every manner a King, before such title had been given by Caesar. He thought of himself highly and is said to have committed suicide after being banished. Archelaus received the Tetrarchy of Judea last will of his father, though a previous will had bequeathed it to his brother Antipas. He was proclaimed king by the army, but declined to assume the title until he had submitted his claims to Caesar Augustus in Rome. In Rome he was opposed by Antipas and by many of the Jews, who feared his cruelty, based on the murder of 3000; but in 4 BCE Augustus allotted to him the greater part of the kingdom (Samaria, Judea, and Idumea) with the title of ethnarch (not king). Archelaus held, in honour of Zeus, nine days of games in Dion, a small Macedonian village on the slopes of Mount Olympus. Mount Olympus, in Greek mythology, was the home of the gods. While Archelaus’ games were not the famed Olympics, they are an example of the value the ancient Greeks placed on the connections between body, mind and spirit. My friend Brenda Hendricks just posted a wonderful video on the gife of grace we receive in Christ. It shows some of the great moments in the life of Jesus and it is quite beautifully done. So many things distract us from Jesus, so many ads for new products that they say we need, so many news stories that are mostly depressing and tragic. There’s so much noise that keeps us from hearing the silence of the silent night. Today, we present to you one of the most Incredible Christmas Story ever told. It was told to us by Luke, “a Disciple of Jesus Christ,” with no trees or lights, just a manger and animals and a too-crowded inn. It isn’t surprising that there was no room for them in the village inn considering the number of travelers flocking to various cities during the time of this census. God uses His Word to encourage our hearts with the blessings that we have through His Son Jesus Christ. He tells us in Philemon that knowledge of the good things we have in Christ Jesus empowers us to share our faith effectively. 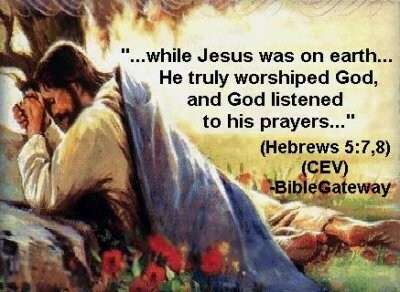 According to the [[Bible]], ”’Jesus Christ”’ was the son of [[God]] born to a virgin named [[Mary]]. The teachings of Christ, a philosophy of total love and total brotherhood, would become the foundation for the [[Christianity|Christian]] [[religion|faith]]. People are too busy with other things while forgetting the real reason of celebrating Christmas. In our daily lives, we have all our reason just to excuse ourselves in encountering God. You don’t have to travel thousand miles to meet God, you just have to exert effort. As another Christmas approaches and the usual holiday laments are unpacked like so many old ornaments — too much commercialism and too little faith, too much food and too little time — there has always been one reassuring constant: The reason for the season is the birth of Jesus some 2,000 years ago. Believers and skeptics can argue with each other, and among themselves, about exactly who Jesus was and what he meant, Ehrman said in an interview. But arguing that Jesus did not exist “is such a ridiculous proposition.”Ehrman said beyond the non-Christian references to Jesus from the era, scholars can plausibly trace elements in the Gospels to shortly after the time Jesus was killed. That fact, and the historical details in the Gospels, have convinced “virtually every scholar … in the Western world” that Jesus existed. Nobody every expected Jesusto be born in a manger. Nor was riding on a donkey worth calling a triumphal royal entry into Jerusalem.The leading interpreters were completely blindsided by the appearance of the Messiah — partly because their envy blinded them, but also because they interpreted erroneously. Over 400 years before Jesus, Zechariah foretold how God would one day come and live with men. “‘Shout and be glad, O Daughter of Zion. For I am coming, and I will live among you,’ declares the Lord. ‘Many nations will be joined with the Lord in that day and will become my people. I will live among you and you will know that the Lord Almighty has sent me to you’” (Zechariah 2:10-11). LK3:18 So with many words like these John continued to encourage the people as he preached the Good News. LK3:19 Now, Herod the tetrarch had been rebuked by John regarding Herodias who was his brother’s wife, and also about other evil things Herod did. LK3:20 On top of it all Herod also added the imprisonment of John. Matthew 14:3-12: For details see notes in Nazarene Commentary 2000 on Matthew. Mark 6:17-29: For details see notes in Nazarene Commentary 2000 on Mark. The life of Jesus began in north and central Palestine, a region between the Dead Sea and the Jordan River in the east and the Eastern Mediterranean in the west. This region was under Roman control since the 1st century BCE, initially as a tributary kingdom. The Roman campaigns, coupled with internal revolts and the incursion of the Parthians, made the region very unstable and chaotic up until 37 BCE, when Herod the Great (c.73 BCE – 4 BCE) became king king of Judea, and Malthace. The region gradually gained political stability and became prosperous. Although Jewish in religion, Herod was a vassal king who served the interests of the Roman Empire. When Herod the Great died his son Herod the tetrarch or Herod Antipater (Greek: Ἡρῴδης Ἀντίπατρος, Hērǭdēs Antipatros; born before 20 BC – died after 39 AD), known by the nickname Antipas, became as tetrarch (“ruler of a quarter”) the much spoken of 1st-century ruler of Galilee and Perea. He is best known today for accounts in the New Testament of his role in events that led to the executions of John the Baptist and Jesus of Nazareth. Herod the Great made great efforts to mollify the Jews by publicly observing the Law, by building a temple, and by re-establishing the Sanhedrin. He promoted Hellenisation and adorned most of his cities, especially Jerusalem. 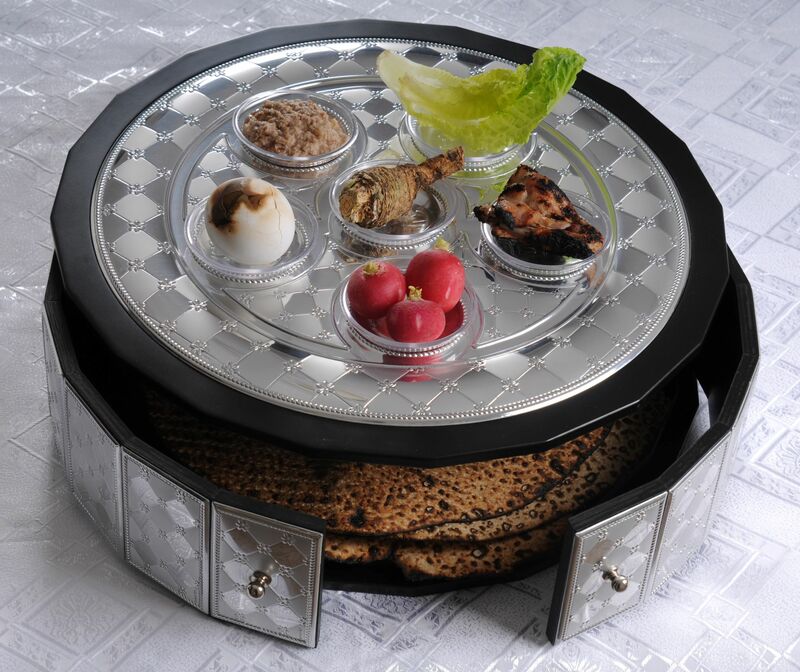 Having felt the difficulty facing Jewish tradition Aantipas also tried to take in account Jewish believes. Antipas tried to avoid conflicts with the Jews and therefore when Pontius Pilate, governor of Judea from 26 AD to 36 AD, caused offence by placing votive shields in the Antonia palace at Jerusalem, Antipas and his brothers successfully petitioned for their removal. Jesus saw his cousin John the Baptist as an authority and possibly a source of inspiration. It seems that he performed baptisms parallel to John the Baptist (John 3.22). This baptiser and preacher reached a lot of people but was not afraid to call Antipas his relation as incestuous and a sin against God. John called the leader ‘That fox Herod’ (Luke 13.32) Herodias may have fancied the preacher and was jealous of his popularity. She was responsible for the beheading of John the Baptist. Herod Antipas was exiled by the Romans. Share: It is interesting to note the first answer to the question, “What shall we do?” The spirit is at the center of what the Nazarene is to teach later. [Luke 6:30-35] The early Christians did this in great measure. [Acts 2, 4, 5] For details see notes in Nazarene Commentary 2000 on “sharing” at Romans 12:13 and 2 Corinthians 8:14. Do not collect more tax than is required by law: Or, WMS: stop collecting any more than is prescribed for you. Compare an example at Luke 19:8. Do not extort money: Or, molest no one, rob no one, don’t use threats. It is interesting John does not tell them to leave their military service. Be satisfied with your wages: Or, supplies, provisions. The military is always under paid for what they do. If this writer kept a “top ten list” of the most important chapters of scripture in the Bible, Luke Chapter 3 would almost certainly be in that list, for reasons that will hopefully become apparent by the end of this blog. He told them that their lives needed to reflect a passion for the things that pleased God. “Whoever has two tunics is to share with him who has none, and whoever has food is to do likewise” (Luke 3:11 ESV). He told the tax collectors to “collect no more than you are authorized to do” (Luke 3:13 ESV). He told the soldiers to “not extort money from anyone by threats or by false accusation, and be content with your wages” (Luke 3:14 ESV).John was demanding life change. He was letting them know that their lives were going to have to be distinctively different than what they had been. It wasn’t going to be business as usual. They were to “bear fruits in keeping with repentance” (Luke 3:8 ESV). Things were about to heat up. Expectations were about to ratchet up. He warned them, “even now the axe is laid to the root of the trees. Every tree therefore that does not bear good fruit is cut down and thrown into the fire” (Luke 3:9 ESV). God’s expectations for holiness hadn’t changed. His demands for a people who would live holy lives and act in accordance with His Word and in keeping with their character as one of His children, had not changed. The fruit of repentance should be seen in you as a Christian; this is the demand of John in Matt3:8. Ceremonies are by the way, fruit yielding is more important. Through fruits, you salt the world and give light to those in darkness. By your fruit Jesus derives satisfaction, Mark11:12-13. He made them to know that He never came to abolish the law but to fulfill it. In addition, He made them to know that doing the commandments will give you the status of heaven. These are to prepare them for what He was about to teach them; immorality, divorce, tolerance, anger, lack of love, worries etc. these are the areas where human logics are being utilized to excuse the law. He gave detailed explanation to all these areas. What an incredible impact the preaching of John the Baptist had! We do not realize this at first – but there are clues here and there – look at Acts 18 v.25 and 19 v.3. Paul comes across those at Ephesus who knew only the baptism of John– a vast distance from the Jordan. What stood out in our chapter 3 in Luke today was the bluntness of John’s message; it was far from being simply an appeal to love your neighbour as yourself – which is the substance of the preaching in many churches today. They had to examine themselves and change their ways and “bear fruits in keeping with repentence” – to put it bluntly, to show they were repentant by actions – not just words. Believer’s baptism is not an act of repentance but an expression of personal identification with Christ in His death, burial and resurrection. By being baptized, those who are born again announce their severance from their former lives of sin and their possession of a new life in Christ. Luke 3:7-9 – Vipers, Repent! The coming wrath: Likely including the period of Great Oppression between 66-70 AD. Abraham is our father: Compare John 8:33. A claim relied on by some Jews to this day. Raise up children to Abraham from these rocks: Merely relying on a genealogical connection with Abraham is of no value. Every tree not producing good fruit: Compare Matthew 7:19 where Jesus teaches the same. Hurled into the fire: The analogy is to the brush fire resulting from burning up pruned limbs. Compare Luke 3:17. Next: Nazarene Commentary Luke 3:7-9 – Vipers, Repent! where is written that early in the 2nd millennium before the Common Era, the first Hebrew patriarch was born. In the history of humankind we can see that the Almighty God, Jehovah used his power to overcome any obstacle that the fulfillment of his promise, to Abraham, might prevent to come in fulfilment. The father of Isaac was to be the patriarch for God’s People. In time, Abraham was indeed the father of the Israelites and had not only to be seen as the father or patriarch of the Jews, but also of the Christians as well as Muslims. They all should believe in the promise of a great posterity which would come when a great empire would be inherited by the People of God. We should all look forward to the time when the world would come to see the promised land. From the trunk of the patriarch of the people of Israel a large earthly king would come (David) from which the Messiah (Jeshua/Jesus Christ) would be born, which would be a greater king because he should rule over the Kingdom of God. In verse 7, John the Baptist is speaking to the crowds that came out to be baptized. In Matthew chapter 3, we are told that Pharisees and Saduccees were among those who had come. The impression that is most natural to take away from John’s harsh-sounding words here are that they are meant for those two groups. But just as likely, they are aimed at any of those who had come without true repentance on their minds. That is what John had been preaching – a baptism of repentance. To the people of the Old Testament period, the word would mean to turn, to return. Their experience of being in exile in Babylon and returning to Jerusalem was a powerful cultural memory to them. When “repent” was translated from the Greek, another meaning emerged: “to go beyond the mind that we have.” So repentance is all about change, to go beyond where we are and open ourselves to transformation. This requires time apart from my cultural context and examination of my motives and areas of my life needing change. To live in or return to the kingdom of God, requires growth and transformation by God’s love, forgiveness, and grace. They were coming to confess their sins and be baptized. This is all well and good, but as David Lose and Karoline Lewis point out here, this isn’t the usual Advent and Christmas theme. Repentance and baptism for the forgiveness of sins is a topic we talk about in Lent as we prepare for Christ’s crucifixion and resurrection, not as we celebrate his birth. John came to prepare the people for the coming of another. Coming events have occurred often in the life of the Judeo-Christian faith: from Egypt, from the desert, from Babylon, the Christ child, John and the second coming of Jesus. We as believers are called to come to and embrace the kingdom of heaven, which is nearby. How have we prepared the way for our coming to this kingdom? Have we applied for citizenship in this new kingdom? In these days as I contemplate John preparing the way for the people, I shall also contemplate my preparation for citizenship and entry into the nearby kingdom of heaven. How about you? According to some of our Rams and Shepherds, apparently our very spiritual lives are in great jeopardy. All due to those unChristian activities, we like to refer to as the Holistic Healing Arts like Yoga. the biblical idea of repentance involves a willingness to turn one’s life around in the sense of a complete re-orientation. the kingdom of heaven is at hand: “heaven” (literally, “the heavens”) is a substitute for the name “God” that was avoided by devout Jews of the time out of reverence. The expression “the kingdom of heaven” occurs only in the gospel of Matthew. It means the effective rule of God over his people. In its fullness it includes not only human obedience to God’s word, but the triumph of God over physical evils, supremely over death. In the expectation found in Jewish apocalyptic, the kingdom was to be ushered in by a judgment in which sinners would be condemned and perish, an expectation shared by the Baptist. This was modified in Christian understanding where the kingdom was seen as being established in stages, culminating with the parousia of Jesus. Luke introduces the ministry of John the Baptist with a careful historical introduction listing the year, the emperor, the rulers of the surrounding territories, and the high priest who was in office. Matthew introduces John’s ministry with a very general, “in those days.” The point is not that Matthew was unaware of the interval of about thirty years that he is passing over. Rather, his purpose was to show that the birth of Christ and the beginning of John the Baptist’s ministry are part of the same flow of God’s activity in salvation history. There are two major sections within this passage. Verses 1-6 introduce the ministry of John the Baptist while verses 7-12 summarize the message of John. To be right with God, it wasn’t good enough just to be children of Abraham. God wanted them to repent of their self-righteousness and replace it with His righteousness. And without God’s righteousness, there’s no redemption!But God’s righteousness can’t be acquired by birthright or by being religious; it can only be imputed by God. And God can only impute His righteousness when there is a penitent heart to receive it, when you acknowledge that you are wrong and God is right. The experience of becoming a Christian is often presented in the guise of being a refurbishment job. The gospel of Jesus Christ is not a “refurbishment” message. Rather it is “demolition and renewal” message. John the Baptist was the man who preached in a demolish and rebuild fashion. Sins: Against the Law of Moses. Bible: Or, book, scroll, writings. The Greek is BIBLO. A voice crying in the desert: The source is Isaiah 40:3-5. Compare Matthew 3:3; Mark 1:3. YHWH: Isaiah has the Tetragram. Historical-Cultural Context. The Gospel reading in light of 1st century Mediterranean culture. if you are repentant, produce the appropriate fruit, and do not presume to tell yourselves, “We have Abraham for our father,” because, I tell you, God can raise children for Abraham from these stones. Even now the axe is laid to the roots of the trees, so that any tree which fails to produce good fruit will be cut down and thrown on the fire. The prophet had some reference to the return of the Jews from Babylon. But this is a small event, compared with that pointed out by the Holy Spirit in the New Testament, when John the Baptist proclaimed the coming of Christ into the world (Matthew 3:3; Mark 1:3; John 1:23). When eastern princes marched through desert countries, ways were prepared for them, and barriers removed. Matthew 3:1–12 describes John’s preparation for Jesus (also see Mark 1:2–8; Luke 3:1–18; John 1:19–28). Although we normally call him “the Baptist,” Matt 3:1-12 does not focus on his baptizing activity as much as on other aspects of his ministry: John as Preacher/Prophet, and John as the Forerunner to Jesus. Contrary to today’s popular misconceptions, biblical prophets do not merely or even primarily “predict” the future. Rather they “speak on behalf of God” (Greek pro-phemi), and they do this through both their words and their actions. Thus, John not only talks like a prophet (preaching a message of repentance), but he also acts like one (as Matthew describes his clothing and diet in the desert). John not only calls all people in general to repent, but he has particularly harsh words for some of the more “religious” people, challenging them to show their repentance in their actions, to “produce good fruit as evidence of your repentance” (3:8), as all other biblical prophets also did. The great yearning for greater fairness in government has been with the human race for a long time. So it was also in the time of the prophet Isaiah, over 720 years Before Christ. If you read through the first ten chapters of the book of Isaiah, you read about injustice and unrighteousness in both the chosen nation and all the “other nations.” And we read about a lot of violence and destruction, a lot of gloom, and doom, both in what was then the present, and what was to come. Repent: the biblical idea of repentance involves a willingness to turn one’s life around in the sense of a complete re-orientation. the kingdom of heaven is at hand: “heaven” (literally, “the heavens”) is a substitute for the name “God” that was avoided by devout Jews of the time out of reverence. The expression “the kingdom of heaven” occurs only in the gospel of Matthew. It means the effective rule of God over his people. In its fullness it includes not only human obedience to God’s word, but the triumph of God over physical evils, supremely over death. In the expectation found in Jewish apocalyptic, the kingdom was to be ushered in by a judgment in which sinners would be condemned and perish, an expectation shared by the Baptist. This was modified in Christian understanding where the kingdom was seen as being established in stages, culminating with the parousia of Jesus.